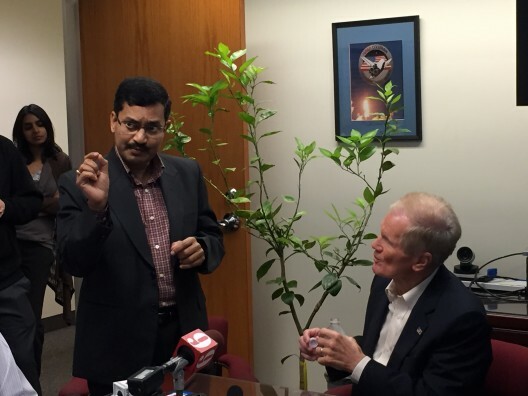 UCF professor Swadeshmukul Santra, left, explains his research into curing citrus greening at a news conference with U.S. Sen. Bill Nelson, right. UCF researcher Swadeshmukul Santra has been awarded a $1.9 million grant to develop a method for protecting the troubled citrus industry from the disease HLB, also known as citrus greening, U.S. Senator Bill Nelson announced Tuesday. In awarding the funding, the U.S. Department of Agriculture also recognized the University of Central Florida as a “Center of Excellence.” That designation, a first for the USDA, recognizes the university’s capability and effectiveness as a research institution. Nelson, who pushed to boost funding for citrus greening research in the federal farm bill, said work by Santra and others looking for a cure was vital for Florida. The grant comes on the heels of $1.7 million the agency awarded UCF in 2015 to study Santra’s use of nanoparticles to guard against the same disease. Field trials are underway in that project, but any new nanoparticle might require a longer regulatory review to ensure the safety of aquatic species, bees, birds and other organism. At the same time, HLB continues to decimate Florida’s $11 billion citrus industry. The new grant allows Santra’s team to research a backup plan that doesn’t rely on nanoparticles and thus could make it to the marketplace more quickly. Greening causes orange, grapefruit and other citrus trees to produce small, bitter fruit that drop prematurely and are unsuitable for sale or juice. Eventually, infected trees die. The bacteria that causes HLB is carried by the Asian citrus psyllid, a tiny insect that feeds on leaves and stems of infected citrus trees, then carries the bacteria to healthy trees. Florida has lost tens of thousands of acres to the disease. Santra’s new project – dubbed MS3T, for Multifunctional Surface, Subsurface and Systemic Technology – targets both the insect and the bacteria it carries. It would be a natural clay-based solution that growers could spray on their trees, forming a film that would act as a barrier between the foliage and the bug. The solution would also deliver a formulation of a quaternary ammonium compound and zinc chelate. Santra hopes his research and field trials will show the mixture will act as a bactericide, killing the bacteria without harming the plant. Santra leads the UCF research team. Laurene Tetard, also of the NanoScience Technology Center, will study how the treatment effects the structure and composition of the plants. Karin Chumbimuni Torres, an assistant professor in UCF’s Chemistry Department, and assistant professor Woo Hyoung Lee from the Department of Civil, Environmental, and Construction Engineering, are developing a sensor to determine the concentration of zinc chelate within a sample of plant tissue. Other institutions collaborating on the research are the University of Florida, which will conduct field trials, the University of Tennessee and Auburn University. Nelson also announced a separate grant for researchers at the University of Florida who are perfecting a technique to use a laser to make an incision in the outer skin of a citrus trees leaves so a bactericide can be applied.